Steering wheel controls, wire harnesses, antenna adapters, wiring diagrams / technical help and PAC aftermarket car audio installation accessories! Steering Wheel Radio Control Interfaces SWIX / SWI X / SWI-X. The SWI-X allows you to retain the use of your steering wheel, rear seat radio controls or your steering wheel AC controls when replacing the factory head unit. The SWI-X will interface almost all infrared head units with almost all vehicles with steering wheel or rear seat controls. Now you can retain the conveniences you paid for while upgrading to a better head unit. 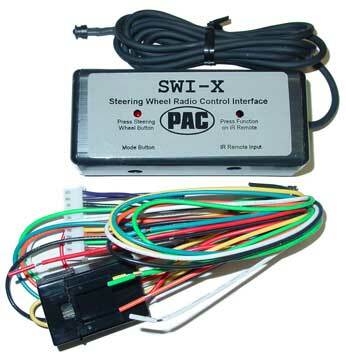 The SWI-X is designed to be universal so it can interface analog or serial data steering wheels. One SWI-X will cover most vehicles that our previous 5 SWI's did and more. The SWI-X converts the signals generated by the factory remote location controls into infrared signals. Easily programmed or reprogrammed using the factory controls and the head units remote control. After installation, the head units remote control can still be used. The SWI-X may be programmed as many times as desired. The simple installation and programming procedures are included in the units instructions. Works with virtually all aftermarket radios with wireless infrared remote capability. Perfect for anyone who wants to upgrade their stereo, but who doesn't want to lose their steering wheel controls for their head unit or A/C systems, or their rear seat controls. Great for the over 2.5 million vehicles that will be sold this year with remote location radio controls. Note: The SWI-X interfaces will only work with infrared remotes that use a 40kHz carrier frequency. Consult with equipment manufacture to determine the carrier frequency.